Anyone who follows my blog will know how delighted I was to be selected as part of The DT for Gill McCall a couple of months ago. Gill was taken into hospital at the weekend having been poorly for a while and is having an op this week. Her friend Lisa, also a DT member, suggested that we held a challenge dedicated to Gill and made cards that would all be posted today to show our support and give her a cyber hug! Gill does so much for so many people, being on design teams, participating in and creating blog hops, setting up groups and challenges and so many more craft-oriented tasks! 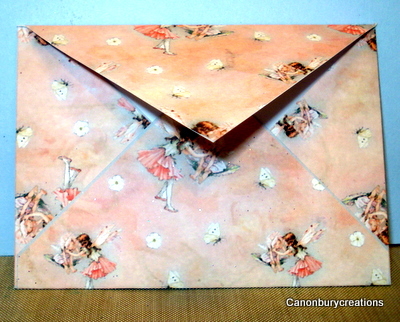 I've chosen to make an ATC and matching envelope, which is something I've only made once before! 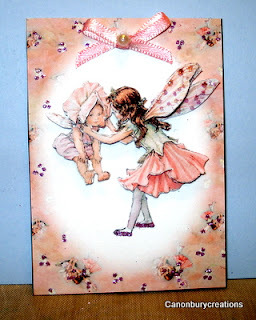 I decided on a fairy theme as it's one of Gill's favourite things and used my flower fairy cd, also for the first time, and the result is below. What a lovely thought Val - the flower fairy images on your ATC are just gorgeous. I am sure Gill will really appreciate her cyber hugs. 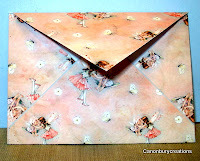 Wow super lovelty card!!!!! I am sure she will love this!!!! Excellent work!!!!! I know she loved it!! I hope she is doing okay. Your card is absolutely wonderful! I like how you did your BG's for the image and her name! !